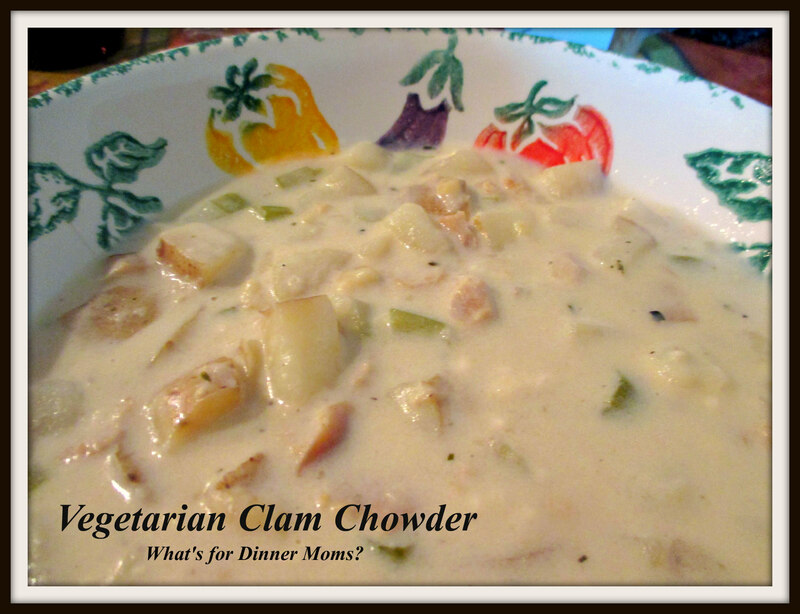 Clam Chowder – What's for Dinner Moms? I am glad my son has agreed to be a pescatarian, one who eats fish or seafood but not meat. It has been a huge adjustment over the past month and a half since he has decided to be a vegetarian. But, I really believe it has improved all our eating habits and made us all more mindful of what we are eating. He sometimes gets frustrated when we go to restaurants and there are few or no vegetarian options but I am teaching him how to order and then ask them to change it so that it fits what he wants or needs. My son has been asking for clam chowder for a week now. Most of the recipes I know to make clam chowder use bacon fat and or chicken stock for flavoring. I had to find a way to infuse the clam chowder with lots of flavor yet make it vegetarian for my son and still be something the rest of us would like. I had my children each help with dinner. My son sautéed the vegetables and drained the clams. My daughter added the liquids and made the thickener for the soup. They both loved talking about how they helped at dinner. I think we all liked this version of Clam Chowder better than one I made back in March. That recipe is here – Clam Chowder with Oh, My Goodness Garlic Bread. It is very similar but with more spices and flour which made it thicker. Both children loved this version of the chowder and asked when we have clam chowder again we make it this way. I served this with garlic bread on the side. Add olive oil to a large pot over medium heat. Add the onion, lightly season with salt and pepper and cook until the onion softens, about 5 minutes, stir occasionally. Add in the potatoes, celery and garlic to the pan and cook, stirring occasionally, for 5 minutes. Add the white wine, bay leaves and thyme to the pot. Bring the entire mixture to a boil and cook until the liquid is almost completely absorbed. Add in the clam juice, from the bottles and canned clams, and vegetable stock to the pan. Bring the mixture to a slow simmer and cook until the potatoes are tender, about 20 minutes. In a saucepan, melt the butter over medium heat. Whisk the flour and butter together. Let it cook 1 minute while constantly stirring. Add a cup of the hot broth from the potatoes to the saucepan. Stir constantly until the mixture is smooth. Whisk in the flour mixture to the soup and cook, stirring occasionally, until thickened. Add the clams and half and half to the soup. Cook until the mixture is heated through 3-5 minutes. Discard the bay leaves prior to serving. Serve immediately. Next Post Wait! You’re Writing About Chinese Takeout for Your 600th Post? I like the bowl too.. or is it a plate? Thank you. It is actually a bowl. It was from a pasta set I received 15 years ago. I save everything! There is no such thing as vegetarian clam chowder (it’s contradictory) so you would have to expect it to be pescaterian. Calling it click bait is childish. And it’s not “Just” clam chowder because most typical clam chowder recipes have a chicken stock base. Thank you so much, Joann. I changed the title for clarification. I made this for my pescetarian 11 year old and it was delicious. I increased the salt and pepper a bit to give it more flavor lacking from a not having a chicken stock base. Rich and creamy with lots of flavor for cold winter nights. Will be making again.